Preliminary investigation determined that a silver Honda Pilot, operated by Sara Edwards (19) of Redmond, was traveling southbound on Hwy 97 when she attempted to avoid a vehicle that was entering Hwy 97 from the Desert Terrace Mobile Estates. Edwards lost control of her vehicle and slid into the northbound lanes and collided with a Mack Concrete Pumping Truck, operated by Michael Cucura IV (36) from Redmond. 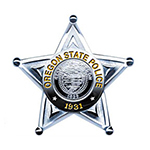 Oregon State Police is requesting anyone that witnessed the crash or has any information to please contact the Oregon State Police Dispatch Center at 1-800-442-0776 or *OSP.